Halloween is obviously a US tradition, but I think every year it seems to get more popular here in New Zealand. I think it’s kinda fun for the littlies to get dressed up, not so sure about the teenagers that don’t even bother and go around demanding treats! When my kids are a bit older I think it will be fun to get together with the neighbours and have a little trick or treat fun. 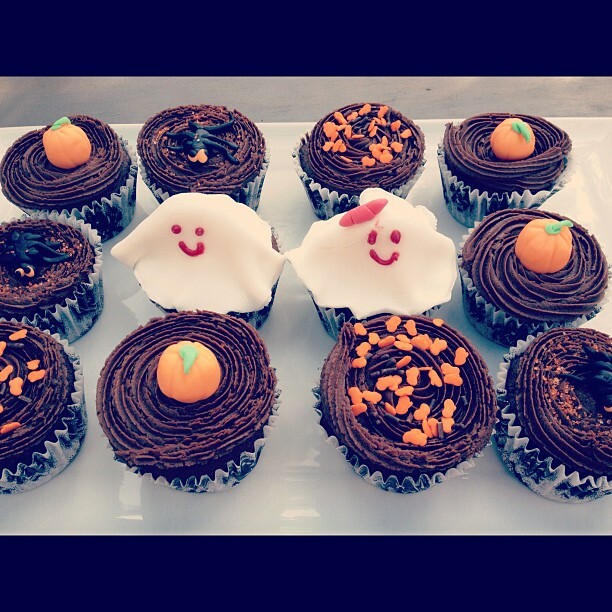 In the meantime, I made some Halloween cupcakes to take to a family gathering, using the ever popular Annabel Langbein Ultimate Chocolate Cake recipe. I just love this cake, it’s so quick and easy to make. My husband’s work social club was also having a Halloween party, so he volunteered me to make the cake which was all good with me! 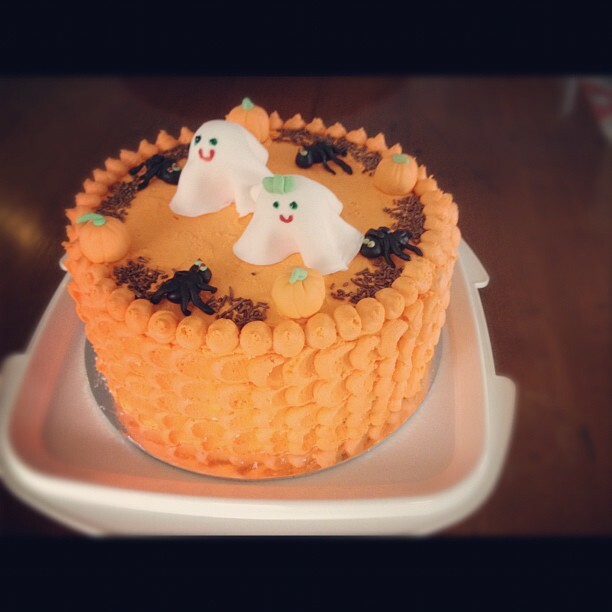 It had to be a BIG cake to feed the masses, so I made a yummy chocolate cake (different recipe to the Annable Langbein one) and decorated it with pumpkins, spiders and not so scary wee ghosts. 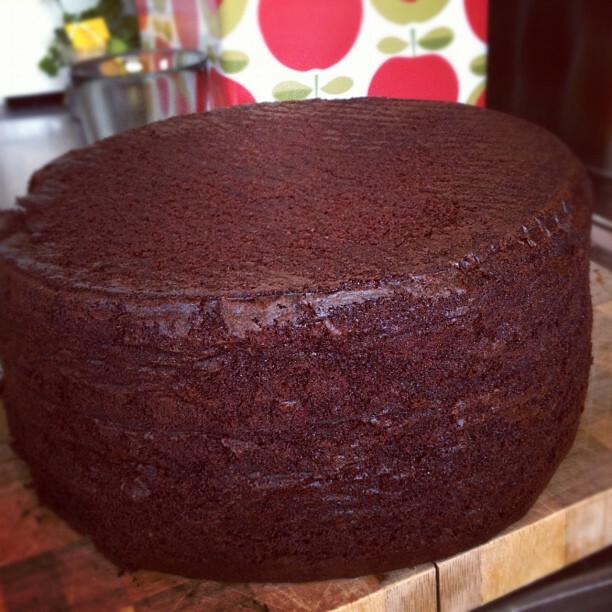 This cake was the 9 inch version, you need a high sided tin – I used a standard tin and I had to do a bit of a patch up job on it where the baking paper had partially collapsed under the weight of the cake, oops. It uses a lot of butter and eggs, but will feed an army. You also need a massive mixing bowl to combine all the ingredients. I did it with my Kitchen Aid mixer, and it was just about overflowing! 1. Preheat oven to 160 degrees (fan bake). Grease and line 7 inch round tin, allowing baking paper to rise up 2 inches above the tin. 2. Combine the vinegar and milk in a jug and leave to go sour. 3. Dice up butter, then add this into a large cake mixer, along with the vanilla, sugar, sifted dry ingredients, eggs and the milk. Beat on low speed until ingredients are combined. Then beat on medium speed for 2 minutes until smooth. Pour into tin and bake for 1 hour 40 minutes or until skewer comes out clean. Cool in tin. For a 9″ round tin, double the recipe, cook for 2 hours at 140 degrees.